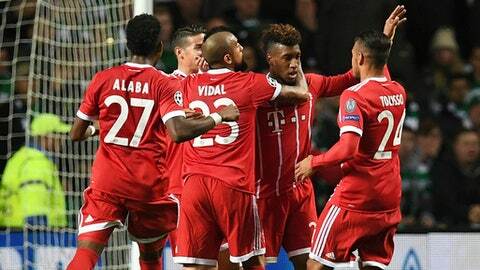 GLASGOW, Scotland (AP) Bayern Munich qualified for the Champions League knockout stage with two games to spare and eliminated Celtic with a 2-1 win over the Scottish champion, sealed by Javi Martinez’s 77th-minute goal on Tuesday. The Spain midfielder headed home a cross by Kingsley Coman, who opened the scoring for a depleted Bayern team in the 22nd minute at Parkhead after a defensive error from a long ball. The German club, which has now won six straight matches since the return of Jupp Heynckes as coach, is guaranteed a top-two finish alongside Paris Saint-Germain. PSG leads Group B on 12 points, three ahead of Bayern, with the two teams still to play each other in Munich. Bayern found it much tougher against Celtic than two weeks ago, when the five-time European champions ran out easy 3-0 winners. It was to be expected, considering forwards Robert Lewandowski and Thomas Muller were out injured and Heynckes rested Mats Hummels, Thiago Alcantara and Joshua Kimmich in view of a Bundesliga match against Borussia Dortmund at the weekend. Celtic stayed in third place and is looking to seal a Europa League spot ahead of last-place Anderlecht, which has no points and no goals so far after a 5-0 loss at PSG on Tuesday. Callum McGregor scored the equalizer for Celtic in the 74th minute.